Spinach, Tomato, and Tortellini Soup -- and Rome. Arriving in Naples, shuffling off the train from Rome to catch the local train to the Amalfi Coast was a highly anticlimactic moment for me. You climb off of this very cosmopolitan, decked-out Trenitalia direct from Rome in Naples, and what you get in front of you is possibly the ugliest train system that I have ever laid eyes on, waiting to whisk you off to the supposed beautiful vacation spots along the coast: it's graffiti-upon-graffiti-covered, dull grey, with scratched windows for ventilation, thick metal luggage racks and yellowing lights overhead, and hard plastic seats--and it rattled enough to make me deaf within a minute of stepping on. My friend described it as reminiscent of old Eastern European transit, and I thought that that was an overly generous comparison. In other words, the Circumvesuviana train (that runs from Naples to Sorrento) did not inspire any confidence in me that the Amalfi Coast was all the vacation wonderland that I had heard it to be. Had I been completely duped? 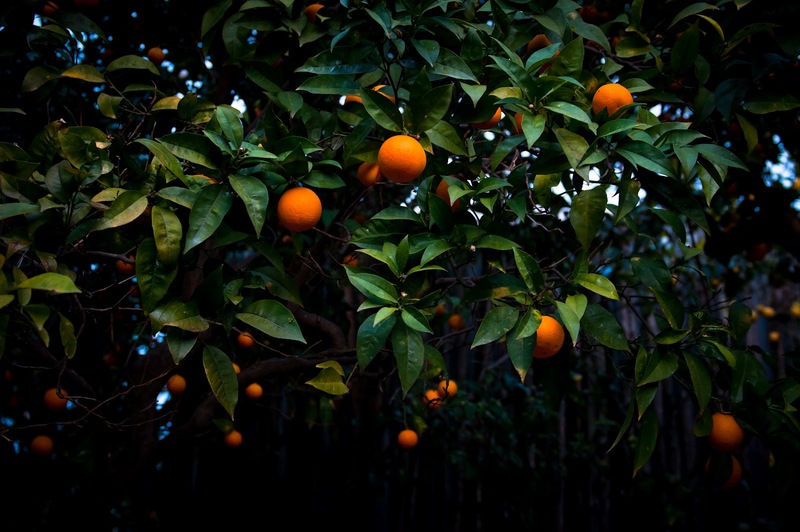 But then-- after an hour or so of rattling about on the train, worrying that my teeth were going to rattle out of their sockets --the citrus groves appeared. Dense and so laden with bright orange and yellow fruits, dotting the lush green landscape that suddenly surrounded and enveloped both sides of the train tracks, the branches of the trees seemed so close that I wanted to reach out and grab a lemon as we sped by. The state of the Circumvesuviana train in no way prepared me for the amazing citrus Eden that is Sorrento and the Amalfi Coast, and all the lemon and orange trees that grow everywhere in the region were more than enough to make up for any doubts I thought I had. Seriously, I don't think I've ever seen so many oranges and lemons in one place ever, and it was like heaven for a citrus-fiend like me. So it's sort of no surprise that I've had oranges (and lemons, but that's for another post) on my mind since getting back from Italy. Even on the plane back, I was already scheming to make an orange cake. It took a few tries in the kitchen of different combinations before I settled on this one: orange-olive oil cake with chocolate frosting and flaked salt. The cake, though it takes a bit of time to make, is actually a very simple affair: dense and orange-scented, in one extra-tall layer for all the drama of a tall cake and none of the fuss of stacking layers. 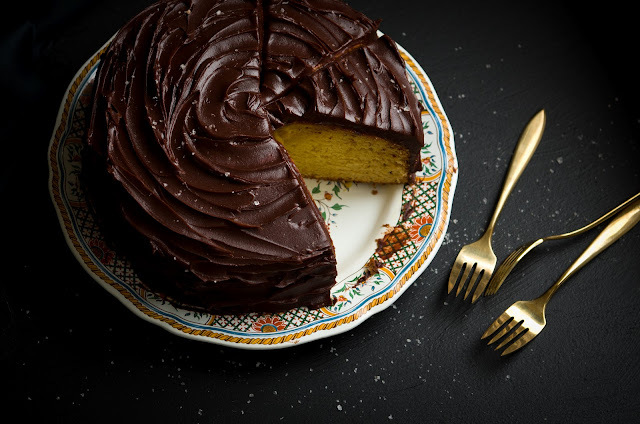 The dark chocolate frosting is fudge-y and delightfully smooth--it's one of my favorite chocolate frosting recipes, originally from this cake--and the combination of orange and chocolate is so classic, for very good reason. Finally, I sprinkled on some flaky, pink finishing salt that a good friend of mine got for me in Portland, and the occasional crunch and hint of salt on top just makes the chocolate even fudgier and the cake even more orange-y. It's a simple and perfect "every day is special" slice. 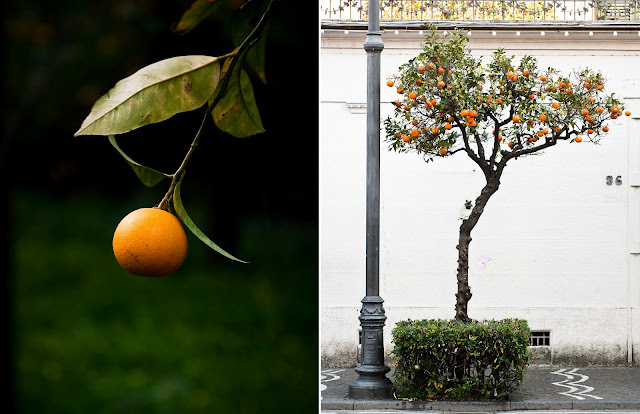 ... you know, since we can't all be amongst the citrus groves in Sorrento all the time (sadly!). 1. Make the cake. In a pot, bring 6 cups of water to a boil. 2. Trim 1/2-inch from the tops and bottoms of each orange. Once the water is at a boil, submerge the oranges and cook briefly, about 1 minute. Drain the oranges, discard the water, and repeat the boiling, cooking, and draining two more times. 3. Combine the blanched oranges, 1 cup (200 gr) sugar, and 4 cups water over medium heat. Cook for about 30 minutes while stirring frequently until the sugar dissolves and the orange rinds are fork-tender. Let cool until room temperature. 4. Drain the oranges and remove the seeds. Reserving the cooking liquid for glaze. 5. Preheat the oven to 350 degrees F. Grease and flour a 8 x 3-inch cake pan and set aside. 6. In a bowl, mix to combine the flour, baking powder, baking soda, and salt. 7. In a food processor, blend the cooked oranges (including rind) until a chunky puree. 8. Add the remaining sugar, eggs, vanilla extract, 1 tspn orange blossom water, and flour mixture. Process for 2 minutes until well-incorporated. 9. Gradually drizzle in the olive oil and process until incorporated. 10. Pour the batter into the prepared cake pan. Bake for 40 - 45 minutes, until a toothpick inserted into the center of the cake comes out cleanly. Remove from the oven and let cool on a wire rack. 11. Meanwhile, mix to combine 2 Tbspn of cooking liquid, 1 tspn orange blossom water, and orange juice. Remove the cake from the pan. Poke the top of the cake all over with a skewer or fork and brush the liquid on the cake. Let cool completely on a wire rack. 12. Make the frosting. Chop the chocolate and butter and set aside. 13. In a saucepan, bring the sugar and heavy cream to a boil over medium heat. Reduce the heat to low and simmer for 6 minutes. Do not let the saucepan overflow. 15. Remove from heat and stir in the chocolate and butter until melted. 16. Stir in the vanilla extract. Let the frosting cool completely, whisking occasionally during cooling. Once completely cool at room temperature, the frosting will be spreadable. 17. Sprinkle the frosted cake with finishing salt. This cake sounds and looks so delicious! 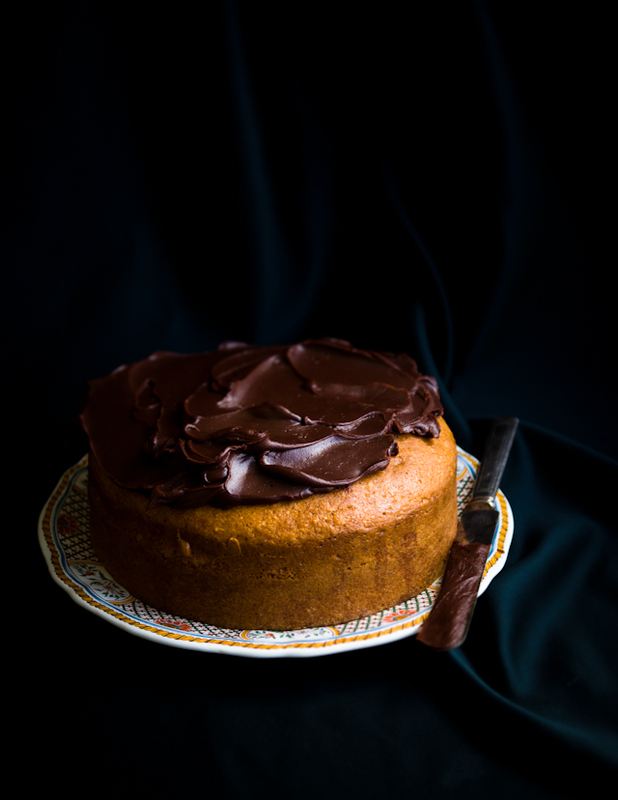 I absolutely love the orange and chocolate combinations, especially in a cake. Mmmm! What an excellent combination....and it's so beautiful! :D I love the photos with the oranges too! What a fabulous cake! Your photos are always so pretty to look at. So inspiring! Your photos are always so unbelievable. They alone make me want to bake and eat this cake right.damn.now. So I probably will - I mean, why fight it? Now we're talking chocolate! Good idea to use olive oil instead of butter for the cake, as the chocolate frosting makes it rich enough. Nice pictures! 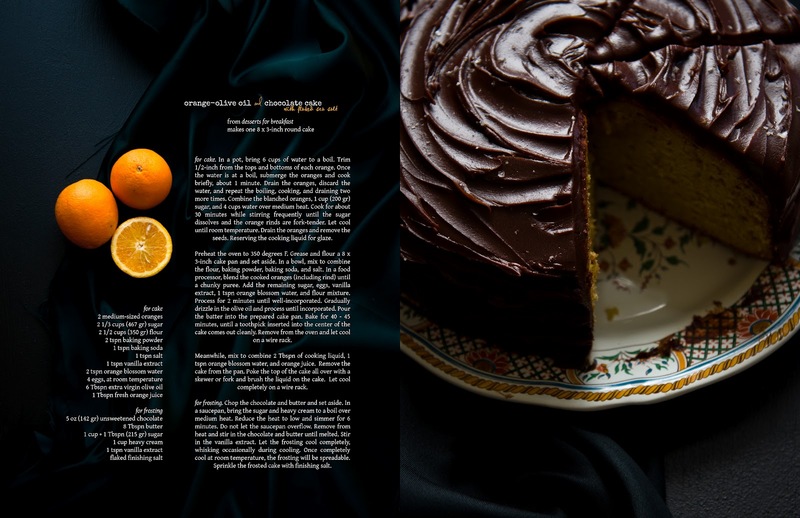 I love the idea of the oranges pureed into the cake! I would imagine the flavour would be incredible. Those local Italian trains are pretty awful aren't they?! But totally worth the bone-rattling ride to arrive the other end and be presented with such stunning scenery. I adore the Amalfi Coast and reading this is giving me pangs for Italy (I'm going in August, not too long now!). Your cake looks absolutely divine - definitely need to try that fudgy frosting! Una combinación genial me encanta tiene que estar de lujo. wow these photos are just so stunning! the cake looks and sounds delicious as well! I just adore your photos so much though!! Gorgeous shots! 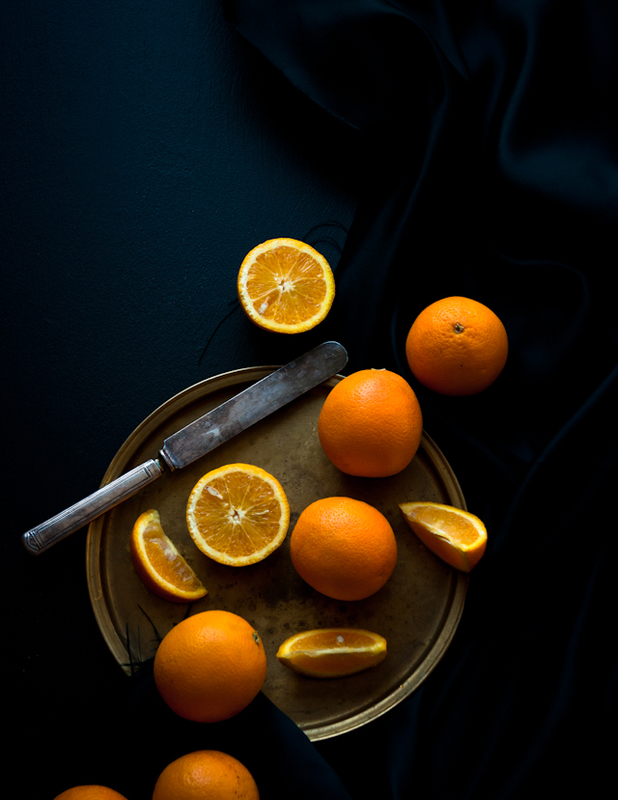 That shot of the oranges on their own on the plate with the knife is stunning! This cake sounds fantastic too. Yum. 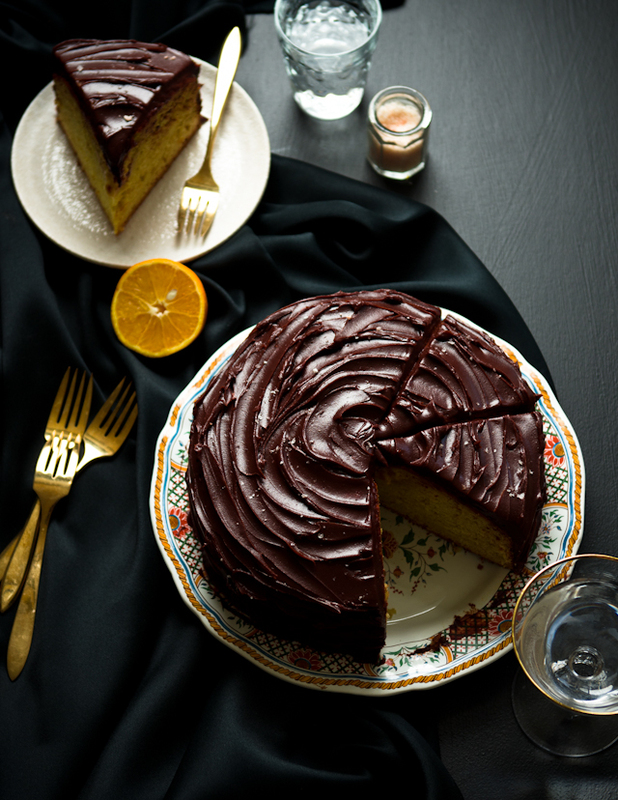 I love the jaffa orange and chocolate combo :) This looks like an amazing cake!!! Thanks for sharing ~ Cna't wait to try it!!!! Is it regular granulated sugar or powdered sugar for the frosting? Such a beautiful post. I love how you spread the frosting on the cake, too, it kinda looks like a flower. I'm ashamed to say I've never had olive oil cake. This looks fabulous! That orange tree is so gorgeous! This post just brought on a flood of memories from my camping trip to Sorrento. I was fairly certain the Circumvisuviana was going derail half the time I was on it. 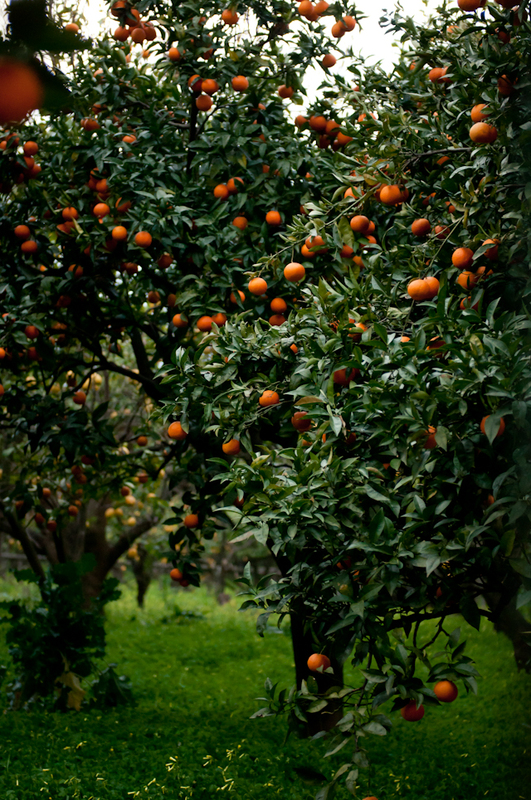 I also couldn't get over the orange groves either(I was sleeping in one for the weekend I spent there). 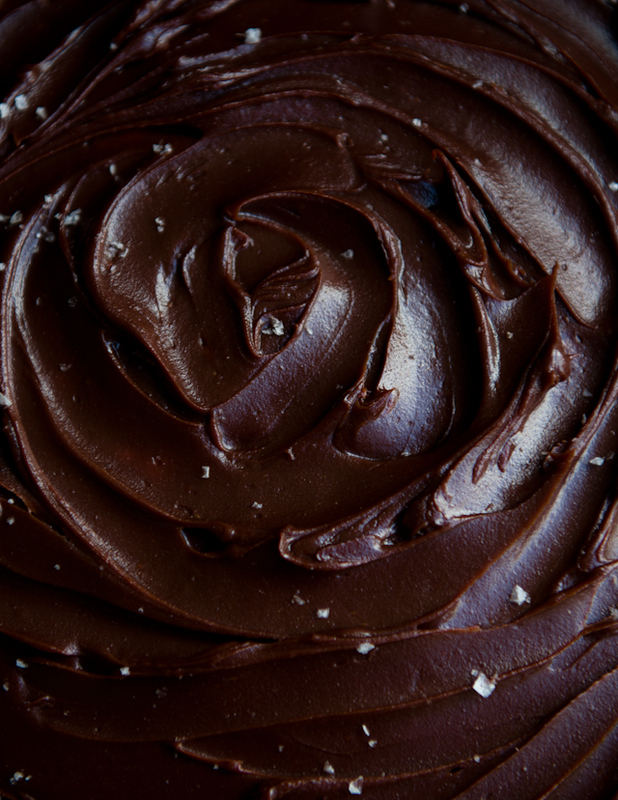 I am usually dubious of olive oil cakes, but the chocolate frosting sold me on this one. What a beautiful and delicious looking cake! 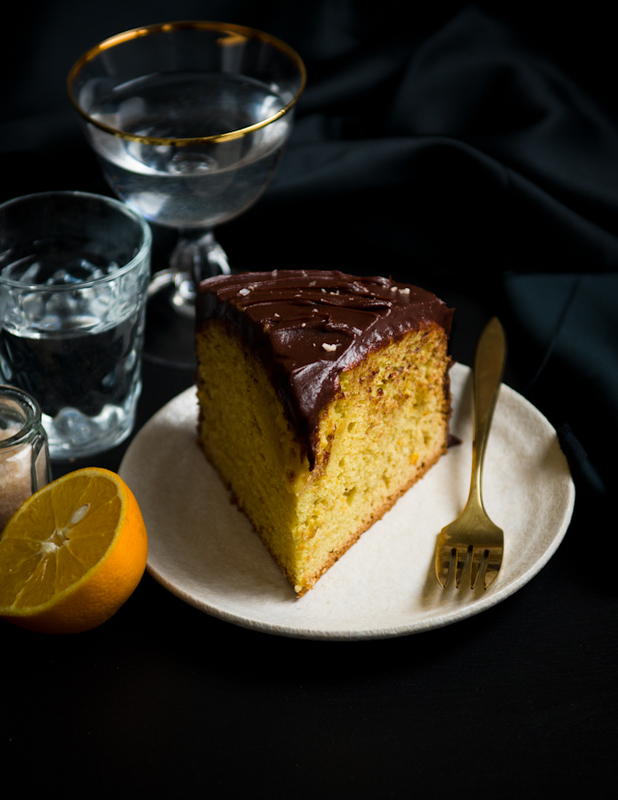 I'm going to Naples myself very soon ... though not the one that's abroad ;) and would like to take advantage of their abundance of oranges by making this cake. Having never blanched oranges before though, I'm a little confused as to how I should remove the seeds from the oranges before pureeing. Please help - thanks! Hi Maggie, Since the oranges are quartered when you blanch them, I just picked out the seeds one by one with a fork. It wasn't too difficult, just a bit bothersome. Such a gorgeous, gorgeous cake and vivid story to go along with it. Lovely post, Stephanie! Love your blog! I have been to the Amalfi Coast once and I so long to go back one day soon for perhaps a cooking vacation! I love the fresh & healthy cuisine of southern Italy! Cake sounds delicious, love the pairing of chocolate & orange! Yum! Where does one find orange blossom water? Hello! I have been an avid reader for some time and made many of your recipes- they have all been fabulous! I have a quick question about this one however. I made it tonight and after 55 min my tester toothpick still wasn't coming out clean from the middle of the cake but the sides looked as if they were completely drying out- so I pulled it form the oven and sure enough the middle sank in a little. Furthermore, because i had to give a taste to a very hungry man, I made two cupcakes (the cake is for tomorrow)- so my pan had even less batter. Is there any chance that your oven temp was 375? Regardless, the cupcakes were delicious and the icing is to die for good. Hi Katherine -- I emailed you to see if we could troubleshoot this! Wow this looks so delicious! What an interesting and beautiful combination! I would have been terrified and insanely curious to get on that train! I'm not sure which one would have won. I'm glad you went though, the pictures of the trees and fruit are so vibrant and amazing. And the cake, oh I would just eat that frosting by the spoonful.